If you remove the caterpillars from an evening primrose population, the plants will adjust, and adjust fast. Within even a few generations intelligent changes arise reflecting the absence of the predator. For instance, in plots protected from insects, the flowering time and defensive chemicals against the insects adjust. 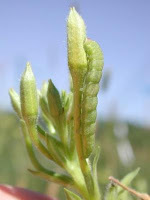 The plant’s resistance to insects is reduced, which makes sense since the insects are no longer attacking the plant. And in exchange, the plant’s competitive ability is improved. In other words, remove a threat that the plant had to defend against, and the plant population immediately and intelligently exploits the opportunity. It is yet another fascinating example of biology’s many built-in adaptation capabilities. Yet evolutionists claim it demonstrates evolution occurring in “real time.” To understand this move we need to begin with three underlying concepts: deep time, the definition of evolution and blowback. Eventually those arguments fell by the wayside and in the twentieth century the age of the earth was extended into the billions of years. All was well as evolution had its much needed deep time. You can read more about this here. The point is that because evolution is based on random chance, it would require a very long time to construct biology’s many wonders. But a century later the story is changing. What science reveals is remarkable changes can come about in only a few years time as populations respond to environmental shifts and challenges. The reason such change can arise quickly because it is not by chance. It is not brought about by random mutations undergoing natural selection. Instead, it is directed by complex adaptation mechanisms, built-in to the species. Amazingly, the response of evolutionists has been to claim this is yet more proof of evolution. They do this by equivocating on evolution. As we have pointed out before the word evolution can take on different meanings. Probably the most concise definition of evolution is: the origin of species by strictly natural means. More generally evolution refers to cosmological origins as well as biological origins. In other words, the naturalistic origin of everything. For centuries now theologians, philosophers and scientists have insisted upon the truth of this naturalistic origin of the world for religious reasons. Today we simply say that evolution is a fact. The problem, however, is that the origin of species by strictly natural means runs afoul of the science. Over and over evolution’s explanations and expectations turn up false or unlikely. One problem, such as with the evening primrose, is that the biological change we do observe tends to be in the form of rapid and effective directed adaptations to environmental changes brought about by built-in sophisticated mechanisms. Not only is this change not caused by chance events such as random mutations, but evolution does not explain scientifically how such sophisticated adaptation mechanisms could have evolved in the first place. So one strategy evolutionists have adopted is simply to redefine evolution merely as change over time, or as changes in allele frequencies over time. You can see examples of this here, here, here and here. Of course such definitions are vacuous and trivial. Indeed they would render creationism as a form of evolution. But they make evolution undeniably true. And they immediately transform contradictory findings, such as directed adaptations, from problems to confirmations. This brings us to the problem of evolutionary blowback. Evolution is motivated and justified by theological concerns. As such evolution is a vector for religious influence and control of science. But the harm does not stop there. To absorb and sustain science’s many refutations of their dogma, evolutionists equivocate on evolution and redefine it as the unfalsifiable concept of change over time. Consequently all new findings, no matter how contradictory, are simply interpreted as some new form of evolution, no matter how absurd. It is the ultimate form of blowback. Evolution is redefined as mere genetic change over time and so then mere genetic change over time becomes yet more confirmation of evolution. The evening primrose response to the lack of insects is not interpreted scientifically as an adaptation, but rather as a demonstration of evolution, even real-time evolution. Of course there is nothing in these new findings to suggest the adaptations of the evening primrose could somehow accumulate to provide the large-scale changes evolution requires to explain the origin of species. Indeed evolutionists have no scientific explanation for such large-scale and complexity occurring spontaneously, as they claim it must have. But none of that matters because evolution is now genetic change over time. When it comes to confirming evolution, evolutionists point to the trivial. And then when it comes interpreting evolution, evolutionists insist it is a fact that the biological world arose by itself. Should we laugh or cry? Oh dear, I see that you don't really understand the theory or the phenomenon of evolution. Evolution is a thing that happens, and is described by science. It is not motivated by theology. How pointless that would be. This example of the evening primrose changing is not just a change in genetics with time, but in response to the changing environment. It's simply that the plants less concerned with security against predators, that also spend more resources on growth and reproduction get to pass on their genes more than those that worry about something that's not going to happen: predation. Evolutionary theory is just trying to put words and understanding to the changes that happen to/in organisms. The randomness in evolution is only noise around the selection. Selection causes only certain genes to be passed on, and random mutations expand the set to select from. Evolution is not random, but directed by the environment, which includes prey, predators (including pathogens), climate, geology, geography, etc. and little bit of chance/luck. But that's only a tiny part of the process. The theory of evolution is very falsifyable indeed: if anyone finds birds in the precambrian era, then evolution is false. This hasn't happened, so that and about a million other things that have been found point to evolution being true. It's very scientifically done, rival scientists are very critical of each other's work and will find any fault that exists. So don't think it's just everybody agreeing with each other. Show me a change in species - either living or fossilized; and I don't mean pawning off some adaptation from some bird beak or micro-organism. Then I might regard your comment.